How to Use Author Stats to Determine the value of Guest Posts or Contributions? Guest Posting for branding purpose is an excellent strategy. Author stats in Google Webmasters is a great tool that allows us to determine the value of our approved guest posts or contributions. As a writer, we all want to know the exposure our content is receiving in Google. The author stats column displays the pages that are authored by us along with their impressions, clicks, CTR and average position. These are great metrics to judge the level of user engagement and importance our content is receiving on Google. This is awesome because we don't need GWT access of separate websites to see how our content is performing. We can check impressions and CTR data of every content written by us using a single GWT account. Where to Find Author Stats in GWT? As an example, here is my author stats displaying the level of engagement I have received so far from my different contributions. This is particularly useful to determine which sites are valuable for me and are getting the maximum attention from the search engines. I may increase the frequency of posting content on sites where my content is ranking high in Google. If I am liked as an author, I will be able to enhance my reputation.This tool should be used for branding purpose. Author stats is an excellent way to determine the level of user engagement your content is receiving and great numbers means extra exposure of your authorship. 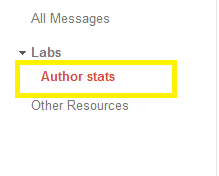 Have you checked the author stats column recently? Let me know in comments below.